by Tim Darling (email) - July, 2008. In 2008, I read John Byrne’s wonderful book, The Whiz Kids: Ten Founding Fathers of American Business - and the Legacy They Left Us. (John is perhaps best known for his later biography of Jack Welch, Jack: Straight from the Gut.) This is basically just a brief summary of the book with a few original thoughts and some notes from other sources added. It’s very detailed for the average weekend reader (at 550 pages). I became so enamored with the characters - Robert McNamara, Tex Thornton, J. Edward Lundy, Arjay Miller, and the others - that I didn’t want to forget their story and the lessons to be learned from them. Perhaps it’s a hyperbole to say that they saved and then almost destroyed the US. But the Kids’ approach would ultimately cause the drop in quality and innovativeness of American cars, opening the door to the Japanese invasion from which the Big 3 have yet to recover. The Whiz Kids’ doctrine is also arguably responsible for America’s continued involvement in the Vietnam War after 1965 which led to the vast majority of the war’s 58,209 US casualties and the millions of Vietnamese military and civilian deaths. They had many of the right ideas. They brought analytical discipline to the military and American business that desperately needed it, but they inadvertantly swung the pendulum too far. Before Tex took over Stat Control, numbers were guessed at and assumptions were rarely questioned in the Air Force. No one even knew how many personnel were serving. Stat Control sent men out to count the number of planes in each hangar and the number of spare parts available at each airfield. The number of bombs that could be delivered to a target per gallon of fuel per plane type were calculated and contrasted. Knowledge is power and Tex’s team quickly earned the power: they were able to enforce high-level decisions based on facts and analyses that no one else had. After the war ended in 1945, the ten Air Force officers who ran Stat Control sold themselves as a group to Henry Ford II. They met with Henry and promised to bring statistical rigor to Ford using the techniques they had developed. They had a huge impact at Ford in the 1950s and 1960s, creating a dynasty and legacy that has influenced almost every American corporation and MBA student ever since. The Kids pushed Ford too far in the direction of management-by-numbers. If an investment couldn’t be proven to add immediate profits to the bottom line, it was voted against. Unfortunately, sophisticated models for quantifying customer loyalty and the value of new equipment and quality were not available to them. McNamara tried to quantify quality for a short time, but gave up when the factory workers easily found ways to rig the system. 8a So Ford cars would leave the lot and break down quickly. The paint jobs were low quality because the painting equipment hadn’t been replaced in years. The Whiz Kids didn’t look far enough ahead with their cost-cutting calculations: would they lose customers and their engineering innovation edge in the long run? Tex resigned in 1953 and dazzled and then dismayed Wall Street as the head of Litton Industries in the 1960s and 1970s. Litton Industries started as a collection of small technology firms; if the Whiz Kids had paved new ground by making a science out of business in the previous ten years, Tex was now paving new ground by making a business out of science. At Litton, he coined the term “synergy” while building one of the first conglomerates in American history, but he used the term too loosely. As Litton grew by acquisitions, there were very few synergies realized. 11 Litton was briefly a Wall Street darling, trading at 50 times earnings, primarily on the basis of shady accounting reports 12 and in their belief in Tex’s promises of synergies and diversification. But as any current MBA student can tell you, synergies can be very elusive and are usually only realized when costs, such as an HR department, can be shared across two companies when each had their own previously. In exchange for synergies, you often receive a larger share of cultural and other problems; Litton was not well-equipped to handle these problems in the long-term. And diversification within a single company is not valuable. Any given stockholder can buy whatever shares they want to diversify their own portfolio; they don’t need a conglomerate to do that for them. Tex died in 1981, shortly after receiving the Medal of Freedom from President Reagan. He was also awarded the Distinguished Service Medal in 1946 for his work in Stat Control and is buried at Arlington Cemetery. He was named President of Ford Motor Company in November 1960, just as JFK was elected. A few weeks later, he would leave the position to serve as the Secretary of Defense for JFK and later Lyndon Johnson. What went wrong with Vietnam? McNamara has since stated that he knew by 1965 that the war in Vietnam was unwinnable militarily. 19 This was an impressive insight at such an early date; the numbers and analyses had served him well. The problem was that he believed that by simply treading water in Vietnam - ie neither winning nor losing the war - we were preventing the fall of all of southeast Asia to communism. He believed that once the dominos started to fall in Asia, the Soviet Union could move their missiles and influence closer and closer to Europe and the US, thus risking a much larger nuclear war. However, as he realized twenty years later, Southeast Asia didn’t want to fall to the communists. In Vietnam we were caught in a nationalistic civil war; we were not defending the world against a larger war. McNamara never questioned the assumption of the domino theory. He never asked, “Do we know that Indonesia, Thailand, Japan, and even Australia would fall to the communists if Vietnam does?” He likely didn’t rigorously question the assumption because it could not be answered quantitatively: to answer it meant to understand and empathize with the leaders and people of that area of the world. Had he insisted on answering it, the entire argument for our involvement in Vietnam after 1965 would have fallen apart. In McNamara’s defense, the 1960s was a very complex and precarious time. He claims that very few people appreciate how close we came to nuclear war with the Soviet Union, especially during the Cuban Missile Crisis. The wonderful documentary Fog of War captures his thoughts, memories, and lessons learned from his time at Ford and during the Cuban Missile Crisis. 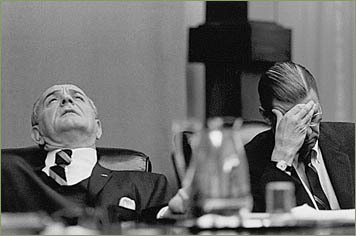 President Lyndon Johnson fired McNamara in 1968, offering him the Presidency of the World Bank. McNamara never spoke out against the Vietnam War until the late 1980s when he admitted to be wrong in his assumptions; he has been heavily criticized for not publicly denouncing the war earlier when it may have helped to bring an earlier end to it. What was wrong with their methodology? What are the lessons learned? We should be aware of our limits to quantify certain key drivers, such as product quality, customer loyalty, the value of investments in R&D and innovation, and what our competitors or enemies are thinking. Just because we can’t quantify some of these elements doesn’t make them any less important. In his memoirs, In Retrospect: The Tragedy and Lessons of Vietnam (which the film Fog of War was based on), McNamara’s first lesson is to empathize with your enemy. 22 Ho Chi Minh was primarily trying to reunite his country and expel foreigners; he was not, as was believed at the time, a Marx-like champion of communism with ambitions to propagate it throughout the world. When we can quantify key drivers, we have to make sure we are looking at the ones which give us the most insight into the overall problem. McNamara’s focus on kill ratios during Vietnam is an obvious violation of this rule. While those values had some meaning, they did not offer sufficient insight into the overall issue at hand: how to protect South Vietnam from the North with the least American and South Vietnamese casualties. Kill ratios, for example, overlook the availability of one side to replenish its lost forces (which was much higher for the North Vietnamese than it was for the US despite the countries' total population difference). They also overlook the magnitude of the causualties on both sides. And finally, they don’t offer any insight into ways to win over the enemy by methods other than raw guerilla combat. Finally, when we can quantify key drivers and we know that they are the most meaningful ones, we have to include in our calculations forecasts of their effects well into the future. The Whiz Kids were hesitant to invest in new equipment needed to improve the quality of Ford’s cars because they calculated that doing so would have no positive impact on the next years’ sales. But consistent investment in equipment, research, and knowledge is often needed to keep a company innovative and in a quality-leadership position. The returns on such investments may not be realized for many years, but forecasts have to account for the long-term positive effects on such investments. During the early years of the Whiz Kids’ reign, factory workers would joke that Ford must be liquidating itself: that was the only explanation for the lack of investment in new equipment and R&D.